Dev Kit - EVK for the Integrated IoT module, with cellular communications (3G, CAT-M1, CAT-NB1), with embedded CPU and embedded firmware, with a wide array of sensor interfaces. Remotely configurable, and cloud connected. Development Kit (EVK) for this micro IoT module, which is an integrated system for cellular IoT sensing and communcations. This OriginIoT has again broken barriers to merging customizable sensor capabilities with GPS tracking via cellular communications. This module can accommodate a wide array of sensors via UART, SPI, I2C or GPIO and combines a penta-band 3G GSM module, with 2G fallback for global coverage, with superior positional accuracy of stand-alone GNSS. Data is configured over a web interface, eliminating the need for additional embedded firmware coding. The ease and flexibility of adding the mini+mighty OriginIoT to a vast array of applications quickens time to market while minimizing the size of your IoT sensor device. 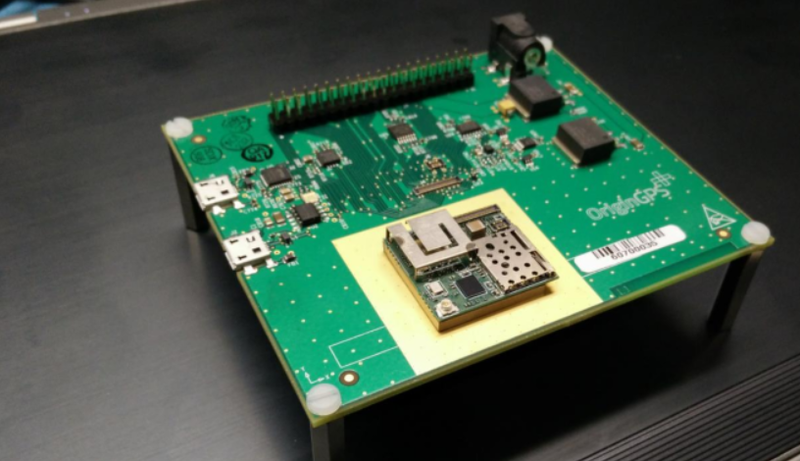 This new module concept enables developing IoT devices and applications in just 6 weeks !!! Accelerometer- ADXL345, U24, by Analog Devices. Gyroscope- DM00168691, U22, by ST.
Electronic Compass- PM13100001, U21, by TXC. Digital Temperature- TMP104, U23, by TI. Cellular Communiction (3G, CAT-M1, CAT-NB1). Embedbed CPU, RAM and Flash. Embedded mbed firmware - completely integrated. Smallest footprint in the market.